The Milwaukee Brewers continue their postseason playoff run with a ninth inning 3-2 walk off victory over the Cincinnati Reds at Miller Park on Friday night. Lyle Overbay’s bases-loaded single off Jumbo Diaz in the ninth inning scored pinch runner Logan Schafer and gave the Brewers their third straight victory. It’s their longest win streak since they put together five straight victories from Aug. 14-19. With Lucroy at second base, Aramis Ramirez moved him to third with a groundout to shortstop. Then Ryan Braun and Gerardo Parra were walked intentionally to bring up Overbay. On Diaz’s first pitch with the bases loaded, Overbay lined a hit to the gap in left-center to send the 31,463 fans home happy. As a pinch hitter, Overbay is hitting .370 with a home run and eight rbi’s this season. 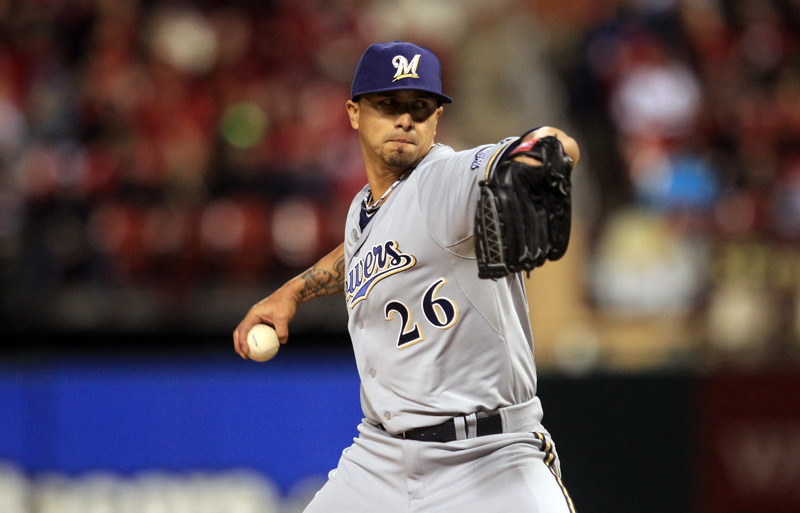 Kyle Lohse started and wasn’t involved in the decision for the Brewers. But he did allow two earned runs on five hits with two walks and six strikeouts, his best start since late August. The victory goes to Francisco Rodriguez (5-5) who worked the top of the 9th for the Brewers, before Overbay’s heroics. Game two of the series is tonight at Miller Park. Yovani Gallardo (8-9, 3.61) pitches for Milwaukee. David Holmberg (0-1, 8.25) goes for the Reds. 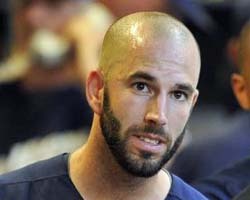 Mike Fiers scattered seven hits and allowed two runs over 6 2/3 innings to lead the Milwaukee Brewers to a 6-2 win over the St. Louis Cardinals on Friday night at Miller Park. Fiers (5-2) walked one and struck out five, on the way to his 6th quality start since joining the Brewers starting rotation on Aug. 9th. Fiers also helped his own cause with a pair of key sacrifice bunts at the plate. Scooter Gennett drove in the Brewers first three runs with a two-run single and a rbi double and Khris Davis gave the Brewers some insurance with a two-run home run that helped knock out Cardinals starter John Lackey. The Brewers took the lead in the third when Lyle Overbay singled, Jean Segura added an infield hit and the two then advanced on Fiers first of two sacrifice bunts. Scooter Gennett followed with a single to center, scoring Overbay and Segura. In the fifth, Jean Segura legged out another infield hit. Fiers bunted him up to second and Gennett followed with a double over the head of Peter Bourjos in center to score Segura. Jonathan Lucroy then singled to drive in Gennett and the Brewers led 4-0. Jhonny Peralta homered in the top of the sixth to make it 4-1, but the Brewers had an answer in the bottom half when Gerardo Parra singled and Khris Davis clubbed his team-high 22nd home run. The Brewers climbed back within three-games of the Cardinals in the NL Central race with the victory. They’ll send Kyle Lohse (12-8, 3.68) to the mound against his former team tonight. The Cardinals will counter with Lance Lynn (14-8, 2.85). up a 6-1 road trip by sweeping the Rockies, improving to 27-15 away from Miller Park this season. That is the best road mark in the majors. On Saturday, the Brewers scored three runs on a wild pitch. Yesterday, Colorado’s Corey Dickerson tripled and tried to score on a throw that got away. But Dickerson tripped and fell on his way to the plate and was thrown out, allowing the Brewers to hang on for the win. The sweep of the Rockies is just the second over Colorado in Denver. The first came back in 2004. The Brewers improved to a season best 17-games over .500 at 47-30, that’s the best mark in the National League, and only a half-game behind the Oakland A’s for the best overall record in baseball. Kyle Lohse worked only 5-innings, allowing 3 runs on 7 hits. But Lohse still earned the win and improved to 9-2 on the season. Lohse walked three and struck out three. Aramis Ramirez and Lyle Overbay (pinch hit) both homered for the Brewers in the victory. The Brewers are back home to host the Washington Nationals at Miller Park tonight. Matt Garza (4-4, 4.02) pitches for the Brewers. Gio Gonzalez (3-4, 4.85) goes for the Nationals. One day after being shut out by Jason Hammel, the Milwaukee Brewers turned the tables on the Chicago Cubs. The Brewers had their best starter on the mound on Sunday as Kyle Lohse squared off against the Cubs top ace Jeff Samardziga, who entered the game tied with Johnny Cueto for the lowest earned-run average in baseball at 1.68. When the dust settled, Lohse tossed a complete game, three hit shutout as the Brewers earned a 9-0 victory, taking two out of three in the series. Lohse saw his record improve to 7-1 and his ERA fall to 2.60. Lohse needed only 93 pitches to go the distance against the Cubs, posting his 8th career shutout. He walked nobody and struck out six. 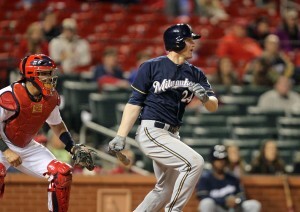 Lohse also helped his cause offensively. He had run-scoring singles in his two at-bats against Samardzija. Lohse started the day hitting .152 and now has dive hits and four runs batted in this season. Ryan Braun clubbed a two run home run in the first inning, giving Lohse a 2-0 lead. Lohse made it 3-0 with a run scoring single in the second. The Brewers blew it open with a five run third inning. Lyle Overbay had the big blow, a three-run double. The Brewers are back home at Miller Park tonight. They’ll send Matt Garza to the mound against the Minnesota Twins. Entering Monday’s game at Miller Park, Milwaukee Brewers reliever Francisco Rodriguez was 17 for 18 in save situations. He would have another opportunity to close out a Brewers victory, taking the mound in the 9th with a 6-4 lead. But Rodriguez couldn’t hold on. He served up two runs in the 9th to see the Orioles tie the game. Baltimore went on to score again in the 10th to win the game 7-6. Khris Davis and Lyle Overbay hit back to back home runs in the 6th inning, trying to get starter Kyle Lohse his 7th win of the season. Jonathan Schoop hit his second home run of the game in the 9th to cut the Brewers lead to just one run. Delmon Young then singled to left and Nick Markakis followed with a double to left center as the Orioles tied the game. The Brewers then missed a chance to win it in the bottom of the 9th. They had the bases loaded with only one out, but Mark Reynolds lined out to the shortstop and Elian Herrera was doubled off third base to end the threat. Rob Wooten came on to pitch the 10th and got the first two outs before former Brewer J.J. Hardy doubled to left. Newly acquired catcher Nick Hundley then blooped a single to left to score Hardy and give the Orioles the lead for good. The Brewers are 3-7 in their last 10-games. They’ll send Matt Garza (2-4) to the mound in game two of the series at Miller Park tonight. extending the Brewers losing streak to three games. Atlanta started the night with the fewest runs scored in the majors this season. But they banged out 15 hits against the Brewers, making a winner out of Mike Minor (2-2). Minor gave up two runs and five hits while striking out five in 6 2/3 innings. Wily Peralta (4-3) took the loss, allowing three runs and nine hits along with a season high four walks. He struck out five in five innings of work. The Braves, leading 4-3 in the 8th-inning, broke the game open by scoring five runs off of 22-year-old reliever Wei-Chung Wang. Wang allowed Doumit’s solo homer, Upton’s two-run blast and run scoring singles from Andrelton Simmons and Ramiro Pena. Wang managed to get just two outs before Brewers skipper Ron Roenicke decided to ask a position player to pitch for the second time this season. First baseman Lyle Overbay came on to record the final out in the eighth inning. Khris Davis and Ryan Braun both homered in the loss for the Brewers. Braun became the fifth player in Brewers history to reach 700 career rbis. He needs 4 rbis to tie Geoff Jenkins for 4th place. Yovani Gallardo (2-2, 3.07) pitches game two of the series for the Brewers tonight. Julio Teheran (2-3, 2.20) goes for the Braves. Cardinals for the second straight night, 5-4. It’s the second straight extra inning win for the Brewers, who beat the Cardinals 5-3 in 12-innings on Monday. The Brewers improved to a major league best 20-7 with the victory and moved to 11-1 on the road this season. The Brewers were missing starters Ryan Braun, Jean Segura and Aramis Ramirez who are all out with injuries, and catcher Jonathan Lucroy who was being given the day off. They played the game with just two healthy players on the bench as well. The winning recipe was more solid pitching and some timely hitting. Kyle Lohse got off to a shaky start when Yadier Molina continued his success against the Brewers right hander with a three-run homer in the first inning. Molina started the day hitting .563 (9 for 16) with two homers against Lohse. On a day when the Boston Red Sox were celebrating their World Series Championship from last fall, collecting their Championship rings before the game, the Milwaukee Brewers spoiled their party at Fenway Park. The Brewers jumped out to a 2-0 lead early with one of the runs coming on Jonathan Lucroy’s first home run of the season. The Red Sox would even the score and it would stay that way until the 9th inning. That’s when Lyle Overbay, hitless on the season, belted a 2-run double to set off a 4-run, 9th inning outburst to propel the Brewers to victory. Marco Estrada worked 5 2/3 innings but wasn’t involved in the decision. Will Smith, Brandon Kintzler and Francisco Rodriguez finished up, with Kintzler getting credit for the victory. Overbay had signed with the Red Sox before the 2013 season but was released near the end of spring training. He then signed with the Yankees where he played the season. Game two of the series is Saturday. Wily Peralta gets the start for the Brewers.